For her birthday this year, my best friend wanted a cute recipe box. You can buy them for about 40 bucks on Etsy, and always thoughtful, she said it would be great if we could "find something cheaper." Orrrrrrrrrrr...you can buy an unfinished wooden box at Michael's with a 40% off coupon, buy a few packs of pre-printed kraft recipe cards on sale from Hobby Lobby, and spend 2 nights + 1 lunch hour +season 4 of Vampire Diaries making your own! Now that I think about it, I think she asked-without-asking me to make one by showing me the $40 version to which she knows I would say, "Uh, pump the brakes. I can do that." Did I get played? This was one of those internet-browsing afternoons where I started by looking for nail polish and ended up finding some kitchen conversion charts on Etsy that I had to have. The longer I looked at them, the more I knew our kitchen was missing something. But why buy one when I could make one?? I used this awesome free chalkboard printable. All of the color variation you see in the photo is part of the file. Then I just typed and tinkered in Photoshop Elements while I watched Burn Notice. The "chalk" is all typed fonts. It's actually very light gray because plain white was a little too stark for me. I printed on quality matte cardstock. I repurposed the frame from here (and repurposed the bird to here). And now, the only thing our kitchen is missing is a cheesecake! Here's when I first realized that I sometimes take J too literally. One day months ago, J and I were leaving work to go to lunch. J: I don't know...love, peace, and chicken grease. me: Uh, Ervin's Fried Chicken...you said chicken grease? J: No babe, it's just a saying. me: Oh. But Ervin's does sound good. And now it's a thing. J: Love, peace, and chicken grease! me: I'll be in the pink room. me: What do you want to name our firstborn? J: Love, peace, and chicken grease. Alex: Oh, and by the way. I did ask Dad what he wants for Father's Day. me: Yeah? What'd he say? Al: Love, p... love, peace, and chicken...chicken grease. I hand-cut all the letters. The background looks like canvas, but it's paper. I really love how it turned out. It's even better than it was in my head. And here is love, peace, and chicken grease on the pink wall that J painted for the pink room that he frequents. I scrapped two projects this weekend, plus half (halves?) of two more, and I uploaded this whole mini album, AND I finished Season 3 of Pretty Little Liars! My scrap room is a mess which is perfect. So first, the mini album made for this infamous day. It's from this class by Maggie Holmes. I pulled out lots of old supplies that I had been hoarding and put them to work. Lots of envelopes, tags, and labels. These worked out great because even after I pared down my photos, I still had too many. I made the vellum envelope in the first photo above. Here's the Father's Day card I made for J last year. I gave him a new nickname, a spin-off of his J-Bird nickname. I opened the card and stitched semi-straight lines along the width of the card to use as journaling lines on the inside. I wrapped up a necktie with some DMC floss to go with the card. Twenty days ago, I found this website which tells you to document one thing per day that makes you happy for 100 days in a row. Wouldn't it be cool to start paying attention to these happinesses and have another way to take a snapshot of my life right now? I can do that! Aaaaaand, I can scrapbook it!! Day 4: As J and I were walking out of Schlotzsky's, we were nudging and rubbing elbows. I said in a faux sweet voice, "Jason! Our elbows are snuggling!" And then I started laughing at my silliness as he tried (and failed) to repress a grin. About 10 minutes later when we were almost back to the office, our hands were both resting on the truck console. I lightly rubbed his pinky with my pinky. This time, I could only whisper, "Jason..." before we both started laughing. Alex: I can't wait until tomorrow! Alex: School! I get to give my presentation! Several times I've caught myself waiting until the end of the day to note my happy thing. I think back on my day, "What made me happy today?" instead of declaring happiness in the moment, which seems to be more of the point. I've also noticed a tendency to come up with multiple happy things (which is a good problem to have, no complaints), so then I want to pick the best or biggest happy thing to award the happy honor to. But when I pick that one thing, I feel like I'm neglecting the others and leaving out huge chunks of the happy story. It's serious work being happy! It makes me very happy. I'm hoping to make all of the foundation pages this weekend while finishing Season 8 of How I Met Your Mother on Netflix. Five months later, I finally made a mini album for the apartment!! The name of my apartment complex was The Retreat. J thought it was the perfect metaphor. Each page is 8" x 3.5". I was inspired to do a fabric spine by Celine Navarro. I pulled out some threads along the edges of each piece of fabric to create the little bit of fray. You can read the blog posts about the apartment haven here. Ali Edwards, who is HUGE in the scrapbooking world, hosts an annual project called One Little Word (you can read more here). To me, it's the attitude you seek to embrace for the new year - a resolution in a mindset. I've never done it before because it somehow didn't seem relevant to me. But at the beginning of last year, this word kept bombarding me. It was showing up in song lyrics, texts, and conversations. It recited itself in my head and made me stand taller (ha, insert obvious joke here). I quickly embraced this urging thinking courage might be my first one little word. So now, 2013 is over, and I survived thrived with courage. Of course I scrapped it. This is now my second-favorite mini album, knocking the grateful mini album down to #3. ...and then when you pull up, the page unfolds! It's like Christmas! Page 4 has my favorite quotes. J loves the photo in the bottom right. I made the album from a Studio Calico class with Nicole Reaves (a Christmas gift from Y!). 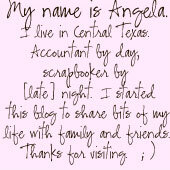 It totally came together once I decided I wanted my "background" to be dark pink. 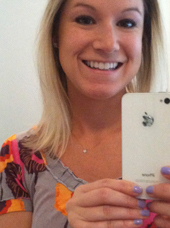 It felt really good to scrap it - the selfies, the quotes, the drama, the successes. Scrapping it felt like I was 1. giving it validity and weight and 2. packing it away, putting it behind me. It's time for a new season! I'd like to introduce you to my second-favorite mini album. The story: My grandparents threw a huge 50th anniversary party. All of their kids and grandkids stayed at their house for the weekend. The night before the party, we all ate dinner together in the dining room. After dinner, my mom and aunts gave a speech celebrating Meme and Papa. They shared memories and told their parents why they love them. It was really nice. Then I gave them their mini album and showed them the pages I made for the party (here, here, and here). The scrappy: I started this album with a set of journaling cards by October Afternoon that I love love love and couldn't get enough of. Most are about the size of a credit card. I left lots of open space for journaling. I didn't want the album to be too bright, so I misted each page with Mister Huey's Clay mist. It makes the whole thing look sort of weathered and worn. Since it documents my grandparents' 50th wedding anniversary eve, I titled it "gold" after their golden anniversary. I was so excited that those chipboard letters matched (and fit!). I used them originally on this page. I mean, the ribbons and trim, the buttons, the doilles, the patterned paper, AND family?? It doesn't get much better. I made this album several years ago in a class with Debby Schuh. As I'm completely in love with my family, I thought I'd share it here. I'm not sure they've ever seen it. I love that the theme is "random." The photos aren't all of one event or person. They aren't even in chronological order. In fact, I determined the order by seeing which photos fit best on each page or tag. They're just old photos that I had in a traditional album that I wanted to showcase. My cousin Erin requested something scrappy, so here we go. This is a card that I made for Christmas this year. I should first tell you that I never very rarely make cards. Cards are not my gig. No photo, no story, and then you give them away just so they can be thrown away?? Nah. But this was one of those great instances when I could immediately see the whole thing in my mind, down to the stitching and the glitter asterisk. My scrapbooking friend Stephanie made the most adorable love jars for her girls. The idea is that each girl opens a sweet sentiment each day from February 1st through Valentine's Day to remind her how loved and lovely she is. I immediately wanted to go home and make one for my husband. I made my notes into mini envelopes because I don't want Dave to peek. (Actually, he would never peek, but I totally would and that makes me suspicious of everyone else!) I mixed in a few "coupons" for little ways we can spend quality time together. I numbered the envelopes 1-14, and each envelope has to be opened on the corresponding day of the month. I did this so that our date nights don't conflict with other things we have on our schedules. I made the whole thing Wednesday night during two episodes of Grey's Anatomy (Drowning on Dry Land and Some Kind of Miracle. Favorite quotes: "The scene where I was a rock star, by the way. Did I mention I'm off probation? Rock star!" "She's not a Jane Doe! It's Meredith Grey! It's Meredith!!" "If I murdered someone, she's the person I'd call to help me drag the corpse across the living room floor...she's my person!"). Before I went to bed that night (and long after Dave was in bed), I put the jar on the shelf in front of the TV (literally blocking the TV) so that he'd be sure to see it in the morning and hopefully come wake me up so I could tell him about it. Yesterday morning, we had this conversation. Me: Did you see the love jar I made for you? Dave: I saw the jar, but I didn't know it was for me. Me: It says, "For Dave." Supplies: Kerr jar from our wedding reception. Patterned paper, die cuts: My Mind's Eye. Rose charm: Making Memories. Twine: We R Memory Keepers. Punch: Fiskars. Doille, buttons, cardstock, lace. I love this envelope and this line so much that I doubled up and used them again. Supplies: Envelope (left over from our wedding). Patterned paper, die cuts: My Mind's Eye. Stamp: Heidi Swapp. Stickers: October Afternoon. Paint. The kit has a Valentine's/love theme: pink, red, white, brown, black, and white. She threw in some of the cutest old game pieces. I love the kraft color of the Bingo card and Scrabble tiles. Here's what I made with the kit. Supplies: Cardstock: Bazzill. Patterned paper: Echo Park, Jillibean Soup. Stickers: Jillibean Soup. Punches: Fiskars. Pen: Sharpie. Two 12 x 12 pages and an envelope for little keepsakes. It would be perfect for little kids who get Valentines from classmates or wives who get sweet notes from husbands (whaaaa?). Even after all of that, I still have patterned paper and a ton of alpha stickers left over. These kits will be rolling out every month, so start looking for them! I'm working on putting the kits together for my holiday tags class! I'm also yelling-singing to The Toadies, "Tyler." If you can't take the class in person, you can buy a kit! Each kit includes all of the paper and embellishments PLUS instructions for each tag AND the bonus ornament. What: Christmas Tags class - I'll walk you through SIX different holiday tags, and then you'll have class time to make a duplicate of each tag. You'll leave with 12 tags plus a bonus ornament! You'll have your choice of two color schemes for the tags - traditional (red, green, and black) or vintage (pink, teal, and silver). Thursday, December 8th from 6:00 - 8:00 p.m. I'd LOVE for any of you to take the class! 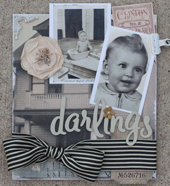 You don't have to be a "scrapbooker" to take this class! You just need to be a teensy bit crafty. If you have any questions, feel free to leave them in the comments or email me. You can go back and read the announcement and my reaction here. *This time has changed. It was originally scheduled for 2:00 - 5:00 p.m. Now you can still make it to the Baylor vs. UT game! Go Bears!